'Coveted' doesn't begin to describe tickets to Mencap's Little Noise Sessions. Guitarist Magazine and MusicRadar have teamed up with Larrivée Guitars and UK distributor Sound Technology Ltd, to bring you a fantastic prize of a pair of VIP tickets to the extraordinary Little Noise Sessions in London this month. Little Noise Sessions is a series of acoustic concerts held annually in London. Respected radio and TV presenter Jo Whiley curates the event, and proceeds go to the charity, Mencap. First held at the beautiful Union Chapel in London's Islington, a Little Noise Session gig typically delivers not only established headline acts, but also the bands of the moment and the stars of tomorrow - back in 2006, for example, Jamie T and Bat For Lashes appeared supporting Guillemots and Amy Winehouse respectively, whereas the following year saw Katy Perry appearing before James Morrison's closing slot. The event also has a habit of delivering special guests - who remain unannounced until stepping on stage - which in past years have included Bono, The Edge, and The Killers. This year also looks set to enjoy its share of surprise guests, too. Larrivée Guitars and Sound Technology Ltd are proud to be a Mencap Music Little Noise Sessions 2012 sponsor. This year's association marks the esteemed guitar maker's continued commitment - Larrivée first teamed with Little Noise Sessions in 2008 - to the annual event. Larrivée instruments will be available to performers throughout the week-long run, and in the days following the closing gig, the guitars will be auctioned off in aid of Mencap. This fantastic prize is a pair of VIP tickets to a night of your choice. To enter just head to the Little Noise Sessions competition page and answer the question below correctly. 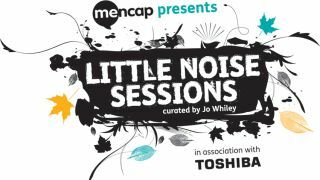 Visit Mencap's Little Noise Sessions and Larrivée Guitars (also on Facebook ) for more information.